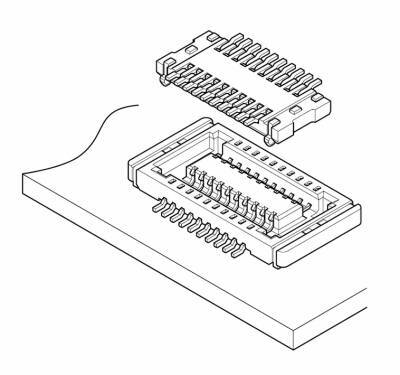 With a stacking height of 1.0mm at 0.4mm pitch the JAN connector is one of the lowest profile board-to-board connectors in the industry. Originally designed for telecommunications equipment, this ultra compact board-to-board connector has a low profile design that is well suited for applications that require high performance connectors in restricted environments. Because of the locking mechanism of the contacts which is made use of the spring performance, after repetition of mating and unmating, lock strength and a feeling of a click are very good. Concentrated stable electrical performance is realized by mating combination of bellows contact roll side on plug and fracture surface side on receptacle. Signal contacts are protected from any external force after mounting on PC board, by soldered reinforcement tabs situated out side of water. 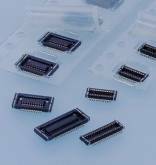 The gold-plated contacts (nickel-stripe) are also available which prevent solder from rising under high-activity reflow condition.